Today brings us the first of the Salon2 podcasts, and it is hosted by Lex Pelger, who I have asked to tell you a little about what his psychedelic clan is up to. 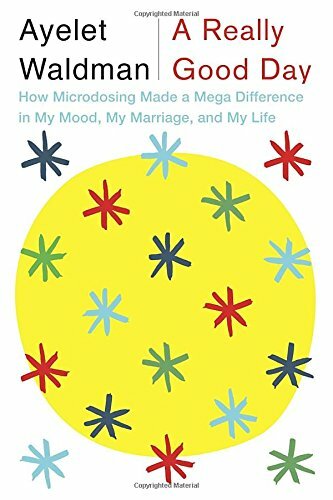 After Lex’s introduction of the Psymposia Team, he will be interviewing Ayelet Waldman about her new book titled “A Really Good Day: How Microdosing Made a Mega Difference in My Mood, My Marriage, and My Life”. Posted in Ayelet Waldman, Books, Consciousness, Creativity, Culture, Family, Lex Pelger, LSD. What/who was the band playing at the end/ outdo of the podcast? They were interesting. the podcast was amazing as well. Yeah, really! Make it out to Austin some time if you can, there’s a great community of like minded people there. In fact, Psymposia will be stopping in Austin on the Blue Dot Tour. Check it out: http://www.psymposia.com/event/blue-dot-tour-austin-tx. Find the others! Homeopathic DMT and a Paleolithic diet worked for me. Thanks everybody for the comments and for your patience. Lorenzo has left giant shoes to fill & it’s enough to make a man nervous. I’m going to do my best to keep the spirit alive & be responsive to the interests of the community. Power to the people. As for microdosing ayahuasca, that’s a vastly important medicine in the Amazon and here in the West. For whatever reason, it can work miracles on people’s gut problems (probably because we have so many serotonin receptors there). As Paracelsus said, the dosage makes the medicine. I firmly believe that there’s as many ways to use these plant medicines & pills as there are people on the planet. At Psymposia, we feature people’s stories because while they might not resonate for every person, some listeners will be nodding their heads in recognition. The most important data about these mysterious plants and altered states of conciousness is each other. Personally I haven’t had much success with micro-dosing. If you have strong blotter then all you need is a VERY tiny piece or else you will overshoot it, and this will cause (in my experience) an uncomfortable body load and an annoying agitation which linger on the whole day. Waldman talks about set and setting, but in case of micro-dosing, DOSE is the most important factor. You do not want to overshoot it. According to Christian Rätsch it’s much more dangerous to underdose psychedelics then taking too big of a dose, and I pretty much agree as this will result in only feeling the negative aspects without all the bliss, insights and possible life changing experiences. Thanks for commenting Lorenzo, and thank you for posting these podcasts. I am very grateful that you have continued posting all these amazing postcasts over the last years! To each its own off course! We are all different and my previous post is only my very subjective opinion. Although Tylenol is probably more toxic then anything in her medicine cabinet, it is not the surest route if she wanted to commit suicide, considering the Valium/Vicodin she mentioned. Liver toxicity is a long drawn out experience, and isn’t near as likely to kill you as breathing suppression from strong downwers like benzo/opiates. Kinda besides the point of the interview, but this inconsistency made me wonder about how deep her knowledge of other drug related topics truly is. All in all, good episode, great topic that I love hearing more about. Anybody catch onto the fact that micro dosing is completely opposite to Terence McKenna’s advise? I just don’t think Waldman made a compelling argument for changing an already perfect method for healing. Imagine going to an Ayahuasca ceremony just to take a tiny sip of tea. Would you be able to see the spirit world and receive information through hallucinations? I don’t think so…So why would LSD be any different? My advise (which could be wrong) is that the Salon2.0 should carry over the spirit of Salon1.0. Something like an introduction by the host, and then a recording of an event or lecture followed by a sign off. Listening to this podcast is having to listen to two people just ramble on about God knows what. I’m just thinking out loud, so thank you for going out there and doing it anyway. Terence McKenna also said “don’t follow gurus, follow plants”. Terence wasn’t a saint, nor was he the ultimate authority on all things psychedelic. There are many modalities, not just one. I agree the spirit of 1.0 should be carried forward into 2.0, but that this should be an alignment of spirit, not an alignment in terms of dogma, format, etc. FYI – microdosing ayahuasca is a fantastic modality that I recommend if you’re someone who’s benefited from large aya dose ceremonies. After reading your comment I’ve decided to listen again and be more open to microdosing. Ive heard that mckenna quote and im just saying I lean towards his recommendation to take enough to have a trip. The 5 dried grams thing was not great advise so im not making him the guru. Im just saying…i think im just irritated lately because i moved to Texas and that comes with a real challenge for even pot smokers let alone psychedelic people.